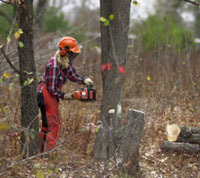 In Part 3 David Rosney makes chainsaw cuts to a tree so it falls where he wants. He also deals with a common problem, a "hung up" tree, where the surrounding trees stop it falling as planned. would have liked to see any little techniques used to make sure that you cut parallel to the sink cut when cuttin the back cut? Great, but it would have been even more helpful to show what was actually being done with chainsaw and lever round the other side of the tree!